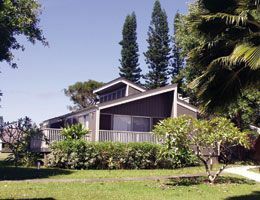 Offering a serene oasis on the enchanting North Shore of Kauai, Wyndham Makai Club Cottages is a pretty, private 17-unit timeshare community close to the legendary natural wonders of Hawaii’s Garden Island. A golfer’s paradise, these peaceful condos are just a short drive from the posh resort community of Princeton where upscale shopping, dining and nightlife provide a perfect balance for the peace and loveliness of the Makai Club. 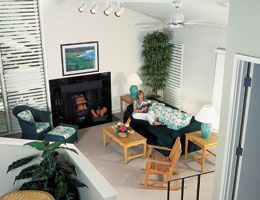 Rent a resort condo or check out the amazing deals available when purchasing a Wyndham Makai Club Cottages timeshare on the resale market; buying from a current owner will save you thousands of dollars on developer’s fees and commissions. Spacious, fully equipped cottages have two bedrooms and two baths and can sleep six. 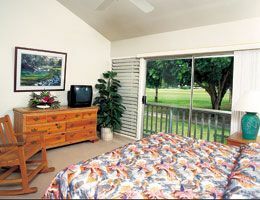 With full kitchen, washer/dryer and private patio, Wyndham Makai Club Cottages are the perfect base from which to explore the dramatic coastline, water-fall laced mountains and hip little towns of Kauai. Nestled on a gentle hillside running along the gorgeously landscaped Makai Golf Course, these stylish condos are completely secluded from the outside world by towering pines and lush jungle foliage. The upscale resort community of Princeton abounds in fun-filled recreational venues. Lucky golfers have two world-class Robert Trent Jones designed golf courses to choose from, while shoppers will delight in chic boutiques, gourmet food stores and dazzling little jewelry shops. After an active day of tennis, hiking and splashing in the pool, sample gourmet Mediterranean-inspired cuisine, locally sourced traditional Hawaiian dishes or incredible sushi in the dazzling array of Princeton restaurants. The Makai Club offers loads of fun-filled events and trips. Take a ride to the Kapaa Farmers’ Market for fresh coconuts, organic produce and traditional arts and crafts, learn the ancient art of Tai Chi or take a garden tour. Cocktail hours by the glittering pool are a chummy warm-up for the evening luau where graceful Hula dancers and whirling fire poi ball twirlers set the stage for an evening of lavish buffets and enchanting traditional music. Ride into Hanapepe Town for Friday Night Art Night and wander beautifully illuminated streets lined with delightful galleries, exciting art exhibits, music and true Hawaiian magic. The friendly staff of the Makai Resort concierge desk is always happy to help you plan new and exciting activities. Book a thrilling helicopter sightseeing tour, take a sunset boat ride, tour Kauai’s historic waterways by mountain tube or soar over the island’s lush rainforests and valleys on an exhilarating zip-line ride. Snorkeling or scuba expeditions are awe-inspiring introductions to the undersea side of Kauai where colorful reef formations teem with tropical fish, dolphins and sea turtles. The ride to nearby Hanalei Bay is so magnificent it’s been designated as a federally recognized scenic roadway. Follow the winding road along the coast, crossing picturesque one-lane bridges while pausing to admire heart-stopping coastal vistas, then spend the day surfing, swimming, windsurfing and canoeing in the azure waters off Hanalei Bay. Be sure to visit the bewitching crown jewel of Kauai, Napali Coast Wilderness State Park, an emerald green fairyland of thick rainforest, cascading waterfalls and fluted sea cliffs. Contact Wyndham Makai Club Cottages Specialist Today! We have stayed in unit 403 several times. Was amazed to learn this is a stand alone house. The back deck is a few steps from trees, grass and golf course. Both bedrooms include a dressing area and bath and are separated by a large living area. The house was clean and very nice. The staff was always helpful and courteous. We barbecued dinner by the pool and spa most evenings. All of Kauai is nice but mostly loved time spent in nearby Hanalei.